On Monday, the German government launches its armed drones programme at the Tel Nof air base in Israel. The Bundeswehr moves into a container village on the base in the south of Tel Aviv. This is confirmed by the German Ministry of Defence when it writes that, on the initiative of the Israeli army, the training of German soldiers will begin with a ceremony at the air base. Tel Nof is one of the most important facilities of the Israeli Air Force, where according to reports nuclear weapons are stationed. Attacks on Gaza are also flown from Tel Nof. After the budget committee of the Bundestag had approved the procurement of Israeli drones on 13 June 2018, the Ministry of Defence signed an operating contract for initially five „Heron TP“ drones on the next day. The contractor is the European arms group Airbus, the drones come from Israel Aerospace Industries Ltd (IAI). The „Heron TP“ will be leased for nine years, initially including five drones. In the event of an operation in Afghanistan or Mali, two additional aircraft are to be purchased. Airbus also provides four ground stations and is responsible for so-called test flights, which have to be carried out after every maintenance or repair. Airbus is also the prime contractor for the „Eurodrone“ and the billion-dollar spy drone project PEGASUS with five „Triton“ drones from Northrop Grumman. The delivery of the „Heron TP“ will take place next year, its stationing and maintenance will then also take place in Tel Nof. Starting next week, six teams each consisting of pilot and payload operator will be trained in two courses. A total of 60 crews are to undergo this eight-week training. They will be taken over from the unarmed „Heron 1“ programme, which the Bundeswehr has been flying in Afghanistan since 2010 and in Mali since 2016. The German „Heron TP“, powered by a turboprop engine, can transport payloads of up to one tonne. It will only be armed after another Bundestag decision has been taken. According to the news agency dpa, the trainings will therefore be conducted exclusively in the „reconnaissance role“. It means that the drones only carry monitoring equipment. This includes optical and radar-based sensors whose images are sent to the ground in real time. The German government has concluded a governmental agreement with Israel for the use of the facility, which is known as „temporary infrastructure“. This is not a binding treaty under international law, stresses the German Ministry of Defence. This means that the facility used by the Bundeswehr will not come under its responsibility and that the Israeli Air Force can restrict its use at any time. This also applies to visits by German deputies, which happened already in November. The implementation of the government contract is regulated in so-called programme agreements. For this purpose, however, procedural regulations must be drawn up which regulate, for example, access to and stay in Tel Nof. According to the German Ministry of Defence, however, this is still outstanding. The Bundeswehr soldiers to be trained should actually be instructed in these regulations next week. The German Government had explained the decision for the „Heron TP“ with a unique missile, only available in Israel, possibly named „Whip Shot“. According to the German Ministry of Defence, the manufacturer refuses to equip this weapon with a U.S. drone, which the ministry explains as a compelling reason for choosing the „Heron TP“. Six other member states of the European Union, which currently procure drones of the same MALE class, on the other hand rely on the US competitor General Atomics. For example, the Spanish and Dutch defence ministries decided to purchase four „Predator B“ drones each from General Atomics (also known as „MQ-9“ or „Reaper“). The Dutch „Predator B“ are to be stationed in Leeuwarden, Frisia, from mid-2020. The Dutch Air Force is considering a cooperation with Italy for the training, but also for the certification procedures. Spain and France had started a similar cooperation after a „Predator B“ crossed the airspace of both countries for the first time a year ago. The Belgian Air Force has also opted for four „Predators“, trading there as „SkyGuardian“. The Israeli company IAI had like in Germany applied for the procurement in Belgium with its „Heron TP“, as had its Israeli competitor Elbit. Allegedly, the selection decision for the US manufacturer had been made because the Israeli drones were not permitted under European regulations. 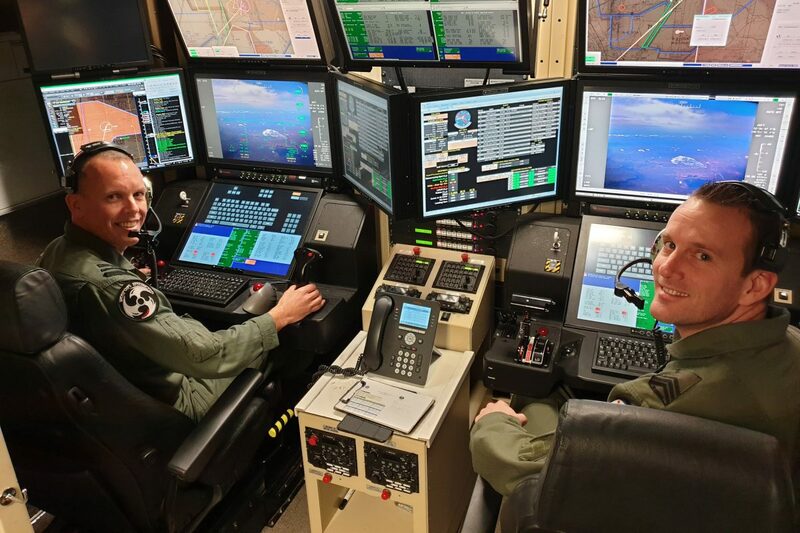 Last week General Atomics announced a cooperation with five Belgian defence companies to enable the integration of the drones into Belgian airspace. The contract also includes the future maintenance of the drones and the provision of satellite equipment for their control and mission management. Radomes from the company SABCA in Limburg will be used for this purpose. According to General Atomics, other European buyers of the „Predator“ could also use the equipment in Belgium for radio communications with the drones. In Belgium, Spain, the Netherlands and Italy the „Predator B“ is flying unarmed. France has recently announced that it will equip its „Predator B“ in Niger with missiles. Great Britain, whose army already equipped the predecessor model „MQ-9 A“ with missiles of the British manufacturer MBDA, is considerably further ahead. Now the British Air Force is switching to the „Predator B“, which was delivered last year for the first time in a direct flight across the Atlantic. The new British drone, known there as the „Protector“, is to be put into service from 2024 and will then also be equipped with missiles of the „Brimstone“ type and laser-controlled „Paveway“ bombs from Raytheon. The British BAE Systems has now signed a development contract with General Atomics so that the drones might also fly in Great Britain’s civil airspace. The press release states that possible approval procedures could also be recognised in the rest of „Europe“. The manufacturer writes that the drone has a collision avoidance system which is mandatory for aviation in civil airspace. General Atomics has also developed a special radar system with which drone pilots can also detect „non-cooperative aircraft“. This refers to aircraft that do not carry a transponder indicating their location. It remains to be seen whether the alternative system from the USA can really be certified in accordance with European aviation regulations. In any case, the Israeli „Heron TP“ lacks such a system. For this reason the German drones are stationed in Israel. Image: Ground control station for Dutch „MQ-9“ (Dutch MoD).